Created, written and co-directed by Sally Wainwright and starring Suranne Jones. 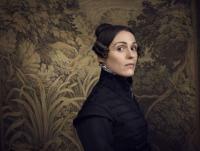 GENTLEMAN JACK tells the story of a woman who had a passion for life and a mind for business, and bucked society’s expectations at every turn. Set in the complex, changing world of 1832 Halifax, West Yorkshire the cradle of the evolving Industrial Revolution. The fifth season of OUTLANDER has begun production in Scotland. Season 5 will play out over 12 episodes, based on material from “The Fiery Cross,”the fifth of eight books in Diana Gabaldon’s international best-selling Outlander series. 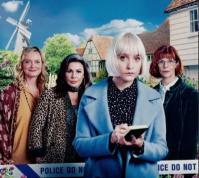 Created by Julian Unthan, this six-part series follows a young police detective, aided by her three crime and mystery-writing aunts, whether she wants it or not. The wickedly offbeat contemporary murder mystery series features bold visuals, quirky characters, fast-paced dialogue and darkly comic murders. On the heels of SUPER TROOPERS 2, co-creator and stars Kevin Heffernan and Steve Lemme don new uniforms in TACOMA FD, a new half-hour comedy series set in a firehouse in one of America’s rainiest cities, where they tackle the less glamorous elements of the job -- like rescuing a spitting Llama stuck in playground equipment. In his weekly podcast, "Primetime Picks Podcast," host David Toledo selects and highlights one must-watch program each day of the upcoming week. In a bit more than 10 minutes, David features a total of six shows -- one for most weeknights and both nights on the weekend. In this new weekly podcast, "Primetime Picks Podcast," host David Toledo selects and highlights one must-watch program each day of the upcoming week. In less than 10 minutes, David features a total of five shows -- one for each weeknight. This wild and crazy action-packed seires re-imagines some of DC's most beloved outcast superheroes -- Robotman, Negative Man, Elasti-Woman and Crazy Jane -- led by modern-day mad scientist Dr. Niles Caulder (aka "The Chief"). The Doom Patrol members suffer horrible accidents that give them superhuman abilities -- but also leave them scarred and disfigured. VALLEY OF THE BOOM features a hybrid of scripted storytelling and documentary interviews with the key players whose stories are dramatized in the show. Silicon Valley spawned some of the world’s most influential people and recognizable brands during the 1990s and attracted geniuses and charlatans alike. After Midge's triumph at the Gaslight, she still has to deal with the fallout from her takedown of Sophie Lennon, making her move up the comedy ladder more challenging and fraught than ever. Amazon Prime Video premieres Season 2 of THE MARVELOUS MRS. MAISEL on Wednesday, December 5, 2018 at 3:01am ET/12:01am PT.